I can’t begin to tell you how much I love this book. From the absolutely delicious title to the heartwarming story to the beautifully nuanced illustrations, The High Rise Glorious Skittle Skat Roarious Sky Pie Angel Food Cake is one of those books that touches the reader on every level. 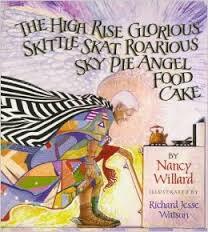 The story, written by Nancy Willard, is about a young girl who wants to give her mother a birthday present, but the only thing her mother really wants is a High Rise Glorious Skittle Skat Roarious Sky Pie Angel Food Cake, just like the one her own grandmother used to make. It was the most delicious cake that ever existed, “irresistible to man and beast, woman and bird.” It even had a gold thimble baked inside. In fact, Great-Grandmother hid her secret recipe, and it’s been lost for decades, because of the danger that it might fall into the wrong hands. The girl’s search for the recipe and the events set in motion when she bakes the cake make for a sweet and charming story. It could be a wonderful jumping-off point for a discussion about a lost loved one or about how love and memories live on. There are religious overtones and references to angels, but the book is not preachy at all, just very thoughtful and lovely. Richard Jesse Watson’s egg tempera illustrations are the perfect complement to the narrative and add an extra layer of magic. They’re a gorgeously detailed blend of realism and the ethereal. You can see more of Watson’s work from the book here. The book includes a recipe for angel food cake. One of the most heartfelt reviews I read was from a teacher whose student made her an angel food cake from the recipe in the book–complete with thimble. Years later, that thimble is still one of her most precious possessions. Unfortunately, this book is a little hard to come by, but you might find a copy in your local library. You can also get it from Amazon by clicking on the cover or title above, or on this link. You have a very nice, interesting, and colorful website. I love the image on your header. You provide a list of interesting activities for children. I personally love books. I have not read “The High Rise Glorious Skittle Skat Roarious Sky Pie Angel Food Cake” book. 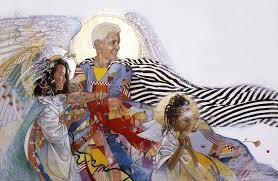 The images or illustrations from Richard Jesse Watson is so detailed and amazing! Nice post, Beth, I enjoyed going through the pages of your website. Thank you, Rosa. I’m glad you enjoyed the illustrations. 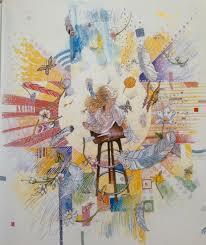 This is one of my favorite books for children, and I love this artist. I appreciate your kind words about the site. I’m a huge book lover too; one of my favorite fantasies involves a bookstore, a blank check, and a U-Haul, LOL. And it seems like the books we read as children and teens are often the ones we carry with us forever.